oh this grandma of mine! after yoga we freshened up, checked out of our hotel and hit the shopping scene again for a few hours. i'm not much of a shopper but park city has great outlet stores so we all walked away with some fun purchases. we grabbed lunch at a local hamburger joint called flippin burgers. it was a great place with great food. then it was off to salt lake where we spent some time at natalie's house relaxing and getting ready to go to the general relief society meeting. we like to watch this broadcast every year together but this year mom was able to get us all tickets to attend it in the conference center in salt lake city. it was great to actually be there in the presence of relief society presidency and the prophet and his counselors. and the messages were a great way to end our time together! thanks for a fun sneak ladies! and thanks for the men who allowed us to sneak away for a couple days. as i mentioned earlier, natalie's favorite thing is "trying new things" so she scheduled us a private party anti-gravity yoga class from 7:30-9am in SLC on saturday. we all enjoyed it! some of us got a little nauseous from hanging and swinging, and my abs are still sore as i type this. but, i wish they had something like this in idaho falls. the instructor was great and had us doing all kinds of things in these hammocks. hanging upside down in a handstand, wrapped upside down like monkeys, using it for arm curls and push ups. and in the end, we were able to lay inside like corpses for about 8 minutes while inhaling essential oils! it was so FUN! these are all kind of blurry, but the instructor was so nice to offer to take some pictures so we could capture some of the poses in pictures. it would be fun to have one of these hanging in your basements. melissa and emily getting ready to jump into their hammock. and here are our pretty toes. emily brought fun fall/halloween colors. purple, reddish orange, and orange. such a fun treat! after shopping for a couple hours we did some dinner. this time we tried out a fancy italian restaurant called ghidotti's. the place was beautiful. the people were great! but, the food?! not so yummy to me and few others at my table. won't be going there again. after dinner we went back to our hotel, threw on our suits and enjoyed a soak in the hot tubs, a steam in the sauna, and then went up and got our toes glitterfied! emily was up until 1:30 am doing toes and we all LOVE them. emily-she brought her glitter toe supplies and beautified all our toes with glitter! i don't know how i missed natalie and katie with the camera! but, katie gave us each a pair of halloween bath & body works foaming soap. 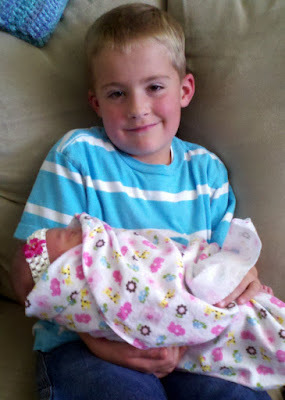 and natalie's favorite thing was treating us all to a anti-gravity yoga class the next morning (more details to come). after favorite things we freshened up and headed out for some shopping! mom-adorable halloween bulbs (one a ghost and one a jack-o-lantern) for the little candlestick lights we all have. me-i wouldn't make a cute bald person, but here i am showing off my favorite thing. a turbie twist. amber-a sweet little personalized charm and peppermint york patty. last weekend the ladies in my family (all NINE of us) snuck away to park city for two days. kevin was great and took friday off work and even woke up early and made me a waffle, bacon, and fried egg breakfast before i left at 8:30am. he wanted to make sure my weekend started off with what a love best...YUMMY FOOD! i picked up all the idahoans and then picked up katie in brigham city. the car ride is half the fun! we met melissa, emily, and natalie in park city. first stop was LUNCH! (; we ate at a great place called red rock junction. they serve fantastic sandwiches. then we went to check into our hotel and because we couldn't stand to wait a second longer we did "favorite things". for a few years now we have been sharing our favorite things at each sister sneak. it's better than christmas! and this year didn't disappoint. mom does a great job getting the bags ready for our spoils. my dear 93-year old grandma was featured in our local paper this month. she is such a mover and shaker but she gets even antsier when the eastern idaho state fair comes around. she loves the fair and that love has been instilled in most of her posterity! we all love the get our little taste of the fair each year. it's tradition...and the manwaring's love tradition! my aunt eja was with her during the "interview" and said that grandma could hardly hold still while being interviewed...too many things to see and people to talk to! no wonder she looks like she is walking away in this picture. i love you grandma! forever young is right! ARTICLE TEXT: There's not much difference between an eager youngster and Eva Manwaring on a sunny day at the Eastern Idaho State Fair. The 93-yeard old woman's face brightened with a youthful, giddy smile as she waltzed through the crowded fairgrounds wednesday afternoon. Her contagious anticipation transformed what could be an overcrowded, grease-saturated festival into a refreshing, homegrown encounter. "It just stars while you're a kid; it's fun and you're supposed to be here," Manwaring said matter-of-factly. 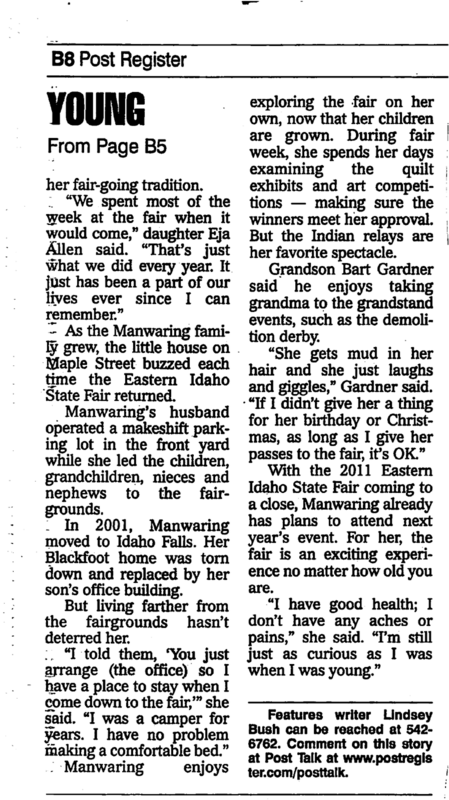 Manwaring, a lifelong eastern Idaho resident, never misses the state fair. As a youngster growing up in and around Blackfoot, she attended the weeklong festivites with her friends, riding rides and admiring animals. But her love for the carnival rides wavered years ago after riding the Ferris while for "too long," she said. A young Manwaring and a friend were the only riders when the Ferris wheel's operator decided to take a lunch break. "We kept going around and around," she said. "I've never been on it since." Years later, Manwaring raised seven children in a home across from the Bingham County Courthouse - just three blocks from the fairgrounds. With a gaggle of youngsters in tow, Manwaring continued her fair-going tradition. "We spent most of the week at the fair when it would come," daughter Eja Allen said. "That's just what we did every year. It just has been a part of our lives ever since I can remember." As the Manwaring family grew, the little house on Maple Street buzzed each time the Eastern Idaho State Fair returned. Manwaring's husband operated a makeshift parking lot in the front yard while she led the children, grandchildren, nieces and nephews to the fairgrounds. In 2001, Manwaring moved to Idaho Falls. Her Blackfoot home was torn down and replaced by her son's office building. But living farther from the fairgrounds hasn't deterred her. "I told them, 'You just arrange (the office) so I have a place to stay when I come down to the fair,"' she said. "I was a camper for years. I have no problem making a comfortable bed." Manwaring enjoys exploring the fair on her own, now that her children are grown. 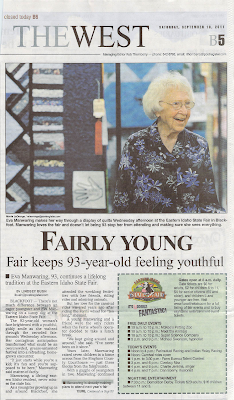 During fair week, she spends her days examining the quilt exhibits and art competitions - making sure the winners meet her approval. But the Indian relays are her favorite spectacle. 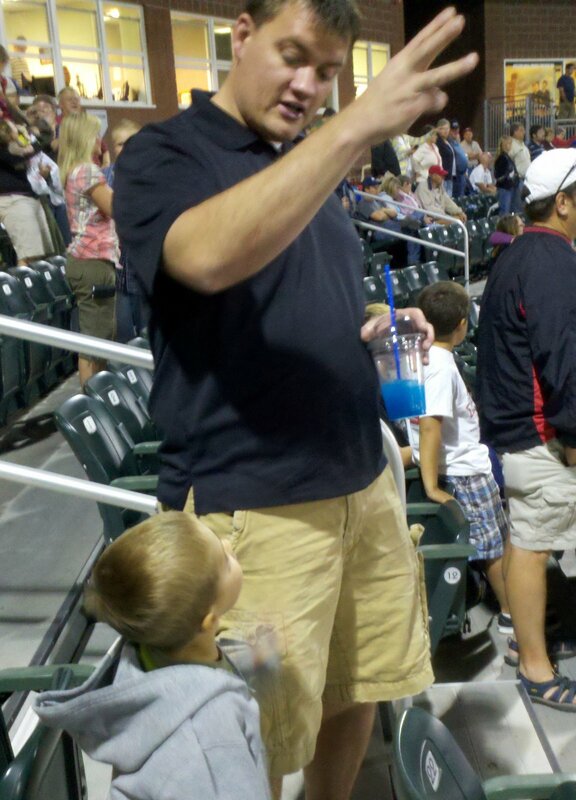 Grandson Bart Gardner said he enjoys taking granda to the grandstand events, such as the demolition derby. "She gets mud in her hair and she just laughs and giggles," Gardner said. 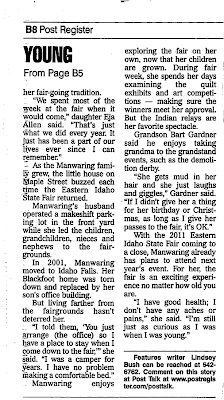 "If i didn't give her a thing for her birthday or Christmas, as long as I give her passes to the fair, it's OK."
With the 2011 Eastern Idaho State Fair coming to a close, Manwaring already has plans to attend next year's event. For her, the fair is an exciting experience no matter how old you are." "I have good health; I don't have any aches or pains," she said. "I'm still just as curious as I was when i was young." it's nearly fall! 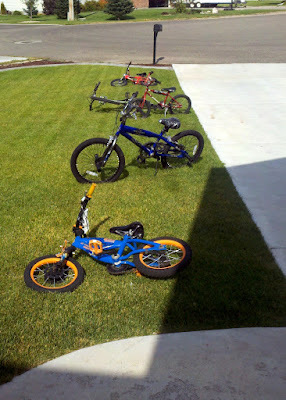 but, i had to laugh at the bike parking out my front door the other day. kevin's sister had her first baby on august 30th. rosanne and rafa welcomed baby zoey into the world. she is precious! and of course we were there to meet her a soon as we could. 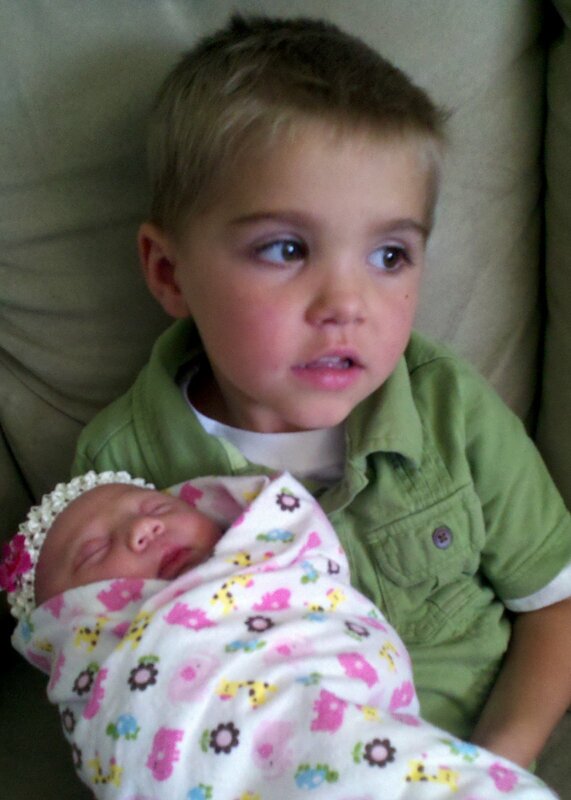 the boys enjoyed holding a little baby girl again. 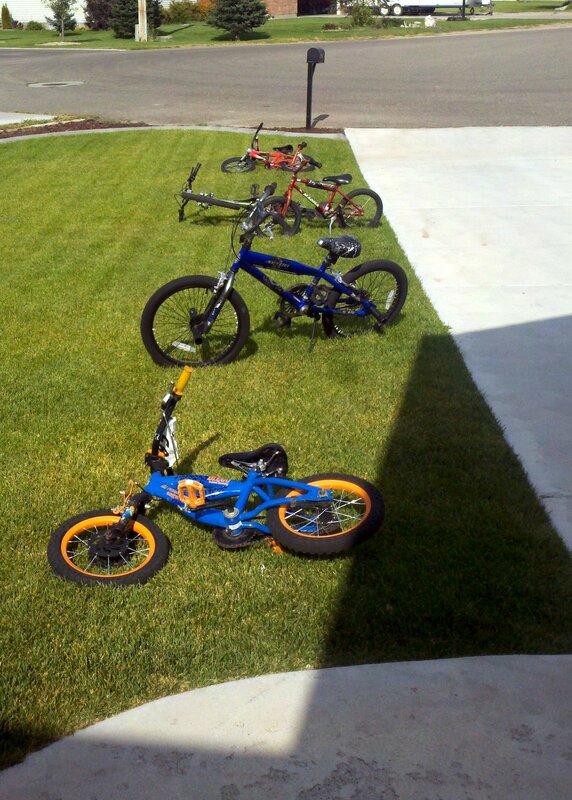 and while we were in utah we did ALOT of playing. 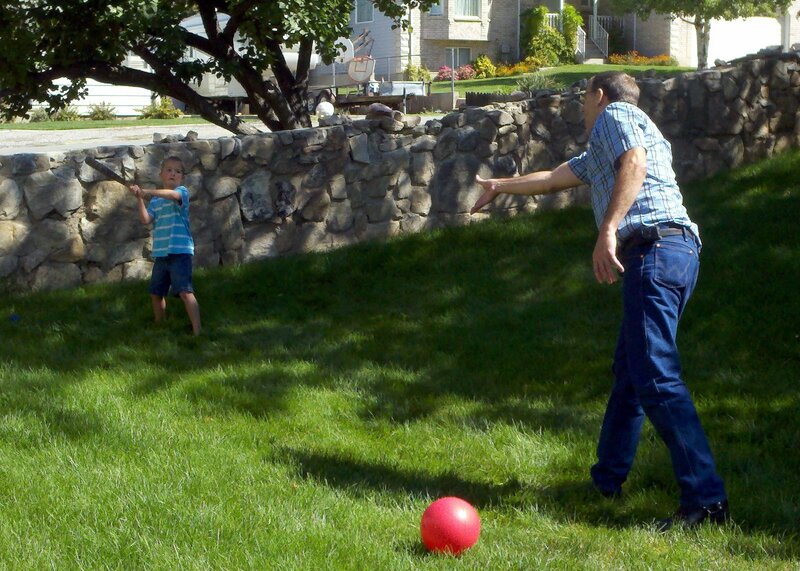 the boys loved playing baseball with grandpa ward and running around with aunt laura. it was a great weekend. 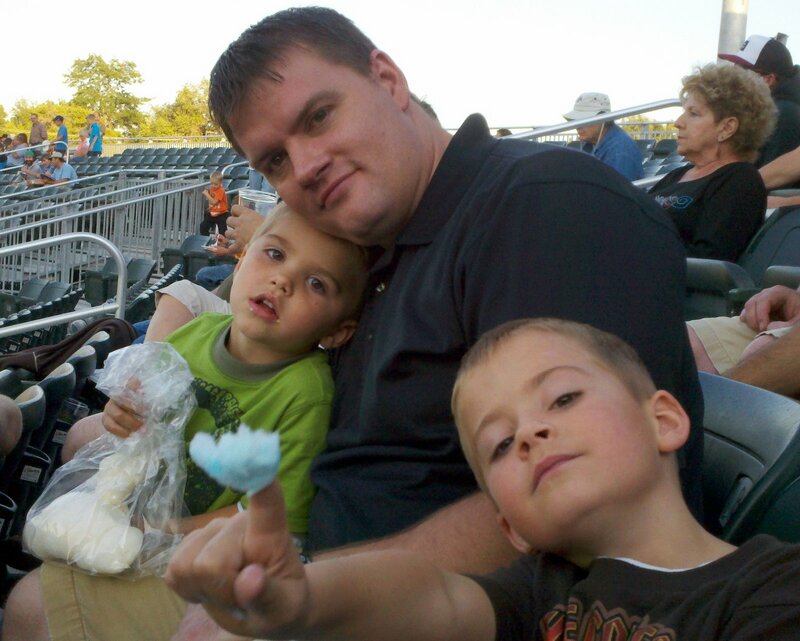 last week we took the boys to a chukars baseball game. 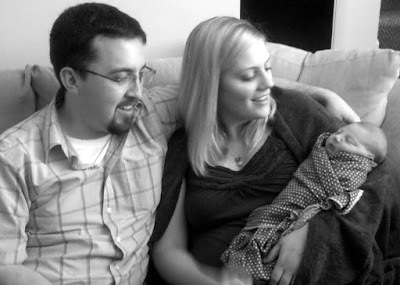 my parents were nice enough to keep madalyn for us (which was a good idea). wesley was REALLY excited when we stood to sing "take me out the ball game". grandma and grandpa manwaring gave him a book with this song for his birthday and he loves singing it. 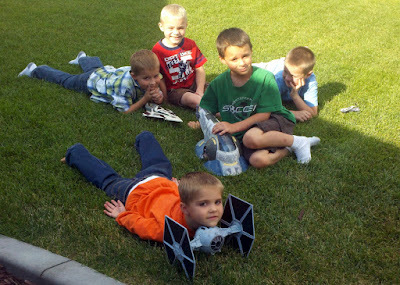 we didn't stay for the entire game, but the boys were pleased to hear in the morning that they chukars had in fact WON! it was a nice evening.